The left overhead cabinet in the pic above will contain my Marey tankless water heater. 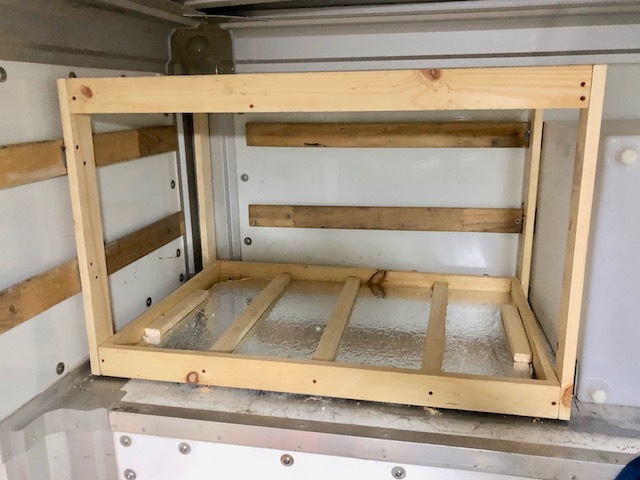 The Marey will be mounted in the right rear of the cabinet. Reader Mister Ed has cautioned about the Marey producing a lot of heat. In that case, I may close off Marey into its own insulated compartment which is open to the rear for heat dissipation. However, because of the small amount of use the Marey water heater will get I do not anticipate any excessive heat problem. I spent most of today working on the cabinet on the right side of the overhead. It is obvious to me that I am a very slow woodworker. But being slow does not bother me one bit! Because I love doing this work. A lot of this woodworking that I am doing is very low tolerance work. But nevertheless, I try to be "right-on" the dimension. The same when joining the parts that make up a cabinet. For example, I always try for a perfect joint. Even when that joint is inside the cabinet and does not show. Did you notice the R-Tech insulation in the pic of the cabinet above? I intend to have the maximum amount of insulation everywhere in living quarters. R-tech insulation is sooooo inexpensive. It would be ridiculous not to use it to the max! Actually, for my health, I have made a deal with myself to be in bed at 11 pm. It's kinda hard for me to keep that deal. But midnite for bed is OK too. I'm pretty far along with the right side overhead cabinet. In the morning I may finish the overhead and begin the main part of my living quarters. I have to get the boards that I am buying to be in a better place for temporary storage. Up until now, I have just unloaded them from the lumber cart on to Box Van's floor. The floor is a very bad place for my lumber. Often, I am not able to avoid walking on those boards. Very bad for a guy like me who has some balance issues. Overhead cabinets at quittin' time! It seems you have a vision but not a plan. Why did you comment this? What in the world do you mean? Oh! That's what he meant! George, how is the fresh water tank anchored in place? You don't want 200 lbs (or whatever it weighs when full) to do any moving in case of an accident or something. I have not personally used VHB tape, but if I was doing your project with the fresh water tank, I would need to know that the water tank has a perfectly flat bottom for 100% surface area adhesion. I would not tape the tank to my foam insulation, as it could just rip the tape and tank right off of your granny floor in an "incident". Most importantly, I would apply a mechanical safety strap around the tank and bolt it into the wood rail on the granny front wall. That is how all residential water heaters are done, and they don't need to be driven down bumpy roads. You need some way to physically keep the tank from moving other than tape. JMHO. There you go again! Trying to be funny! Stick with your best thing. Disseminating your knowledge and experience to us ordinary folks! You know full well that you know more than nearly everybody. You are, a wealth of information!! No doubt in my mind whatsoever about that! I am thankful for your being a Reader of my Blog! You have correctly advised and directed me numerous times. I hope that my writing this here is not a burden for you! It is, however, a major compliment to you. One that you justly deserve! not in The box van but outside somewhere and run a test that's the only real way you're going to know. However, my Marey installation is going to work marvelously. This water heater is perfect for my intended use. I will only use hot water to wash dishes. Maybe 10-minutes use a day. Hooking up the Marey is a 10-minute job, at best. Why all the fuss about this water heater is beyond me. Exactly. The plan can always change, but never the goal! You are doing a wonderful job. Your skills are amazing! I guess that I picked up a whole lot of experience doing all sorts of things along my life's path. 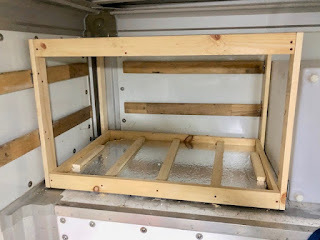 whenever I look at those horizontal wood tie down rails on your walls I think how wonderful that would be for making cleats to drop over them for hanging simple shelves, storage cabinets or even support brackets for lumber storage. So easy to change the location of those elements to match your current needs of today versus your needs for yesterdays projects. I agree! And I used those rails exactly as you described until I began construction of my workshop and living quarters. Consider installing a couple of full width u-shape overhead hangers made of 1x lumber for getting your stuff off the floor until major construction is finished. What is your plan to fill it ?? Look at the 11:51 pm pic above. Below the center of the overhead, between the two cabinets is the pass-thru from the Ford to the Box van. The fresh water tank is mounted in the center between the two cabinets. When I am standing in front of the fresh water tank, I can touch the tank. There will be a door covering the tank. I will be able to run a water hose thru the big rear door to the water tank. Again referring to that pic, the ceiling of my living quarters is at the level of the top of the two cabinets. Around 77". The fresh tank's fill orifice is 71" off the floor. George, are you going to insulate the overhang ceiling? I plan to install insulation between all of my construction and the interior of the Box Van. My water tank is NOT inside a cabinet. My tank is mounted to the overhead's floor. There is a cabinet to the right and left of my water tank.